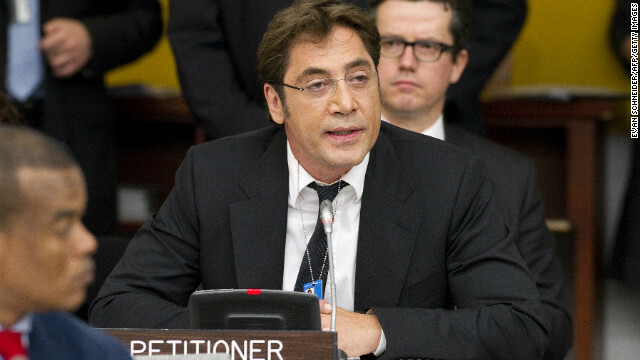 Oscar-winning Spanish actor Javier Bardem addresses the U.N. General Assembly on the issue of Western Sahara in October 2011. 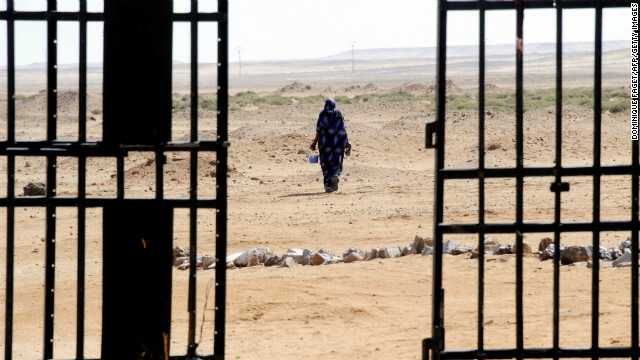 A Sahrawi woman walks in the desert in March 2011 near the Western Sahara refugee camp in Tindouf. 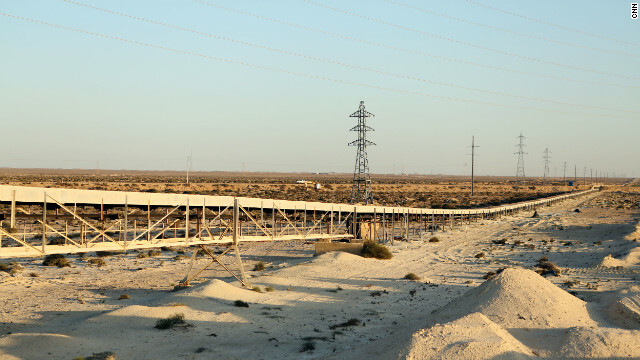 The world's longest conveyor belt connects the Bou Craa phosphate mine to a shipping port south of the city of Laayoune. Many accuse Morocco of illegally extracting phosphate from the disputed territory of Western Sahara. 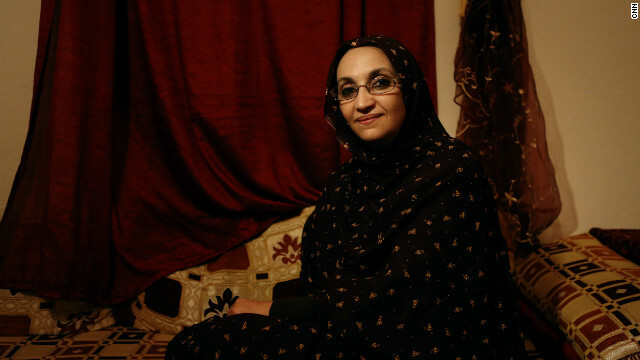 Aminatou Haidar is a Sahrawi human rights activist in Laayoune. She is also the president of the Collective of Sahrawi Human Rights Defenders. 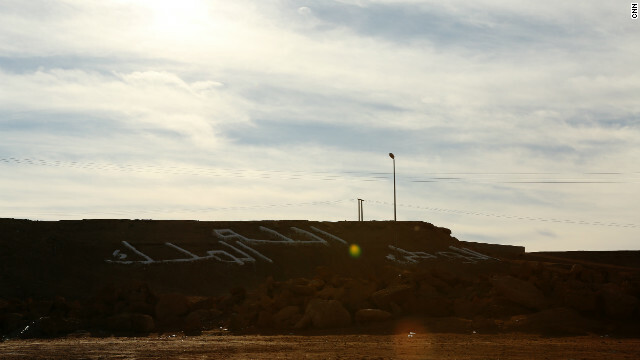 Letters on a hillside near an entrance to the city of Laayoune read "God, country, king." 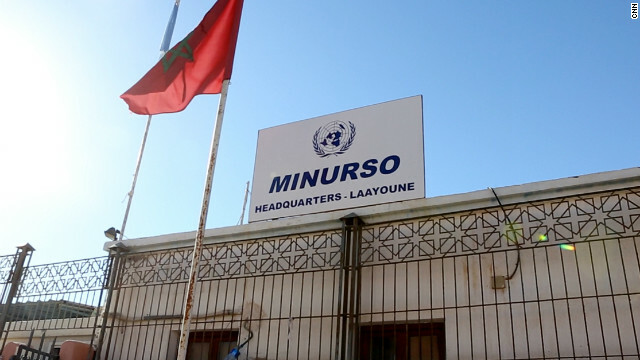 The headquarters of MINURSO in Laayoune. (The United Nations Mission for the Referendum in Western Sahara.) MINURSO is a U.N. peacekeeping mission, and does not have a human rights mandate. 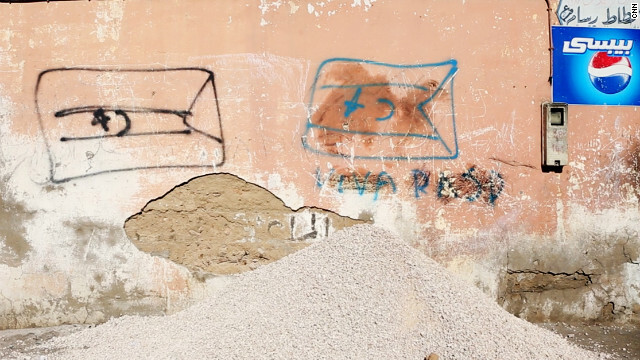 Graffiti of pro-Sahrawi independence flags on a street in Laayoune, the main city of Western Sahara. The city is in the region of the territory administered by Morocco. Javier Bardem is Spain's first actor to win an Oscar. He appears in the current James Bond film, "Skyfall" and his other films include "No Country for Old Men", "Biutiful" and "Vicky Cristina Barcelona." Click here for more details about his film "Sons of the Clouds: The Last Colony." Click here for details of the RFK Foundation Petition on Western Sahara. Madrid (CNN) -- I first went to the Western Sahara in 2008 for the Sahara International Film Festival, the only one of its kind to take place in a refugee camp. I went there knowing only a little about the situation in that region, which has been largely forgotten by most countries' agendas and ignored by the media in general. As is the case with everyone who visits that area, I returned shocked by Morocco's abuse of the Sahrawi people's rights. I only spent 10 days there. Since then, I have been trying to get involved with this issue, and made a movie ("Sons of the Clouds: The Last Colony") to try to bring some attention to this largely forgotten situation. Morocco is a strong strategic North African ally of both Europe and the United States. We know how the world works of course; we understand what is known as "real politik" -- that countries have to deal with other countries whose actions they disapprove of for a "greater economic or strategic interest" -- but I wonder if there shouldn't be something more important than economic and strategic reasons... some moral responsibility preventing us from keeping up relations with countries that violate human rights. The Western Sahara was a colony of Spain until dictator General Franco died in 1975. Following that, we, a weak and unstable Spain, left the land to Morocco, who invaded it militarily. Morocco took military control of two thirds of the territory. This land, rich with phosphates and fishing banks, is an area now known as the occupied territories. A great part of the Sahrawi population fled to Algeria, where up to 300,000 people now live in refugee camps. Franco's death was the end of a very dark period for Spain, and the last thing Spain wanted was more conflict with Morocco. Spain to this day has an administrative role in the Sahara, according to the U.N., and even more importantly has a strong ethical responsibility for what happens to the people there. Not only Spain, but Morocco's strongest allies, France and the United States, are also responsible as world leaders and members of the U.N. Security Council. Together, they must put an end to the Sahrawi people's suffering under the Moroccan occupation. The United Nations envoy, Christopher Ross, has just returned from the region with a report documenting many human rights abuses by Moroccan occupying forces. He has put the two opposing parties -- the Moroccan government and the Sahrawi political arm, Polisario -- together in a bid to hold a referendum as determined by the U.N. peace plan signed by all parties including Morocco in 1991. Morocco instead has been talking about incorporating the occupied territories into a federal state, but the Sahrawi people don't want to be part of a state that invaded and abused them and forced them to give up their resources. In the occupied territories, it is well proven that Morocco has been abusing the human rights of about 200,000 Sahrawi people. It is forbidden for more than two or three people to gather in one place; they face widespread abuse in prison, and have no access to a fair trial. These people are living in darkness. Moroccan authorities don't allow any international witnesses or the media into the occupied territories, in an attempt to block any information regarding the human rights abuses in this area. This situation is very unfair and has been proven to be so. We must not turn a blind eye to these abuses. This month in particular is of great importance because Morocco will hold the rotating presidency of the United Nations Security Council, despite the fact that it is wrong to do so while the Sahrawi are still denied their human rights. I fear this will delay the process of resolving this issue. Legally, the Western Sahara has justice on its side, in the way that 2+2=4, so everything that blocks progress must be overcome. There is another reason to oppose these abuses: after all, the Arab Spring started in the Sahara. Everything is related, and unless this calms down, groups that don't belong in the Western Sahara will be drawn in, and extremism could arise, further complicating the situation. 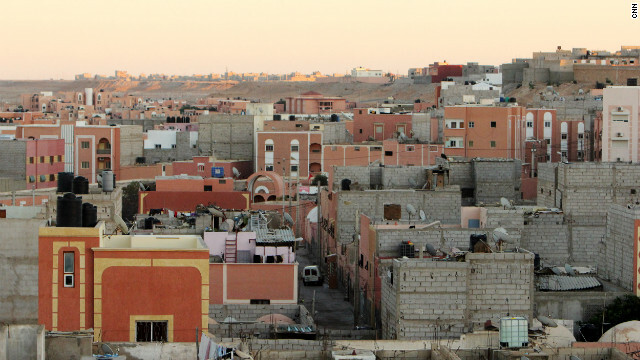 Polisario and the Sahrawi themselves don't agree with Muslim extremists. They are an advanced society, made up of people who have proven their belief in peaceful resistance, international justice and in the U.N. After all, these people have resisted Morocco's abuses for 35 years with an enormous amount of patience and faith in the U.N. resolutions. It is clear then that it is in Morocco's best interest, as much as the Sahrawi people, and the international community for this human rights drama to be resolved. Every country that has a vote on the Security Council should be taking issue with this, supporting Ross in his efforts to bring the two parties together immediately, and putting pressure on the U.S., Spain and France -- the three countries that have the most to say and do about the Moroccan oppression of the Sahrawi people --to resolve this injustice in a fair way once and for all. The situation is critical at this moment; the region's instability is increasing and the young Sahrawis are running out of patience and may resort to violence out of despair and frustration. It has been proven to be dramatically unfair for many years too many. We should not turn a blind eye to these abuses. No matter what our countries' commercial and geostrategic reasons are, should we continue to allow human rights violations in the name of money? Editor's note: CNN invited the Moroccan government to give its response to Javier Bardem's article. This is a response by Khalfi Mustapha, Minister of Communication. Javier Bardem's article presents a biased picture about the situation in the Sahara. It lacks balance and omits information about the Moroccan government's efforts to seek a lasting political solution to this chronic conflict. Furthermore, the article presents a succession of false information which I will briefly analyze in four points. Firstly, the description of conditions in the Tindouf camps distorts reality and lacks balance. Human Rights Watch published in December 2008 a report on "Human Right in Western Sahara and in the Tindouf Refugee Camps" documenting cases of slavery and denial of rights of dissidents to freedom of expression or the right to return to their families in the camps. Following this report, human rights violations by Polisario emerged, including the case of Mustapha Ould Salma, former official of Polisario, who was denied re-entry to the camps after he criticized Polisario leaders and supported Morocco's autonomy plan, and the case of the Sahrawi artist Allal Najem El-Kareh who was subjected to ill-treatment and censorship because of his criticism of Polisario. Furthermore, Bardem says U.N. envoy Christopher Ross "has just returned from the region with a report documenting many human rights abuses," but gives no details to back up this claim. Ross's declaration after his visit in fact contains no such allegations, instead, he states that "this conflict must be resolved and I believe that It can be resolved if there is a will to engage in real dialogue and compromise." Maybe Bardem is unaware of successive Moroccan governments' efforts to promote human rights in the Sahara. In 2004, the Instance of Equity and Reconciliation (IER) received almost 5,000 demands from the Sahara of reparation for past human rights abuses and allocated $72 million to the claimants and for social programs for victims. In 2011 the National Human Rights Council, an independent human rights body, established in the Sahara region three regional commissions, made up of Sahrawi Moroccans, to monitor, examine, report and act on human rights violations like the 10 commissions in other parts of Morocco. This policy has been praised by the U.N. Security Council in its decision No. 1979 of April 27, 2011. The Sahara is not closed to international human rights and other delegations. So far, 22 foreign missions have visited the Sahara, the latest a group of foreign journalists dispatched by the International Women's Media Foundation (IWMF). Before them Juan Mendez, the U.N. Special Special Rapporteur on torture, declared in a press conference at the end of his mission, that "the culture of human rights is emerging but more needed." Secondly, Bardem's ignorance of basic well-known data is alarming. He stated that the population in the Tindouf camps is estimated at 300,000, which contradicts the UNHCR's estimates in 2005 when it reduced the number from 158,000 to only 90,000. Also, the U.N. High Commissioner for Refugees has been continually denied requests by Polisario and Algeria to conduct an accurate census of the camps' population despite the Security Council resolution 2044 of 24 April 2012 on the Sahara conflict. For the record, Gordan Gray, Deputy Assistant Secretary in the U.S. State Department, in his November 17, 2005 presentation before the Subcommittee on Africa, said: "There are credible reports that the Polisario Front has sold portions of international food aid on the black market." Thirdly, Bardem claims -- without presenting any evidence -- that the Sahara is in the darkness, that the local population was forced to give up its resources and that "Spain has an administrative role in the Sahara." In reality, Spain colonized the Sahara at the end of the 19th century and that the land was under Moroccan sovereignty, and resisted Spanish colonial penetration until 1934. Also, many reports of the U.N. general secretary presents "Morocco as the administrative power in the western Sahara," for example the May 23, 2003 report to the Security Council. As for economic and social development, the Sahara region has recorded higher development rates compared with many other regions in Morocco. There are many local democratic institutions beside 52 elected Sahrawi in the Moroccan parliament which deliberate on projects of investment and natural resources. Between 2004 and 2010 $1 billion has been invested in economic and social projects: now more than 95% of the population has access to drinking water; 93% of the population has electricity; there are five hospitals, 37 health centers and 139 educational establishments. The rate of poverty in the Sahara region has been reduced from 29.4% in 1975 to 6.2%. In fact, the government's investments in the region far exceed any revenue generated. For example, the main driver behind the survival of the phosphate mine Phos-Boucoraa was for social reasons rather than economic, with more than 1900 employees, and the company has invested recently more than $325 millions to keep the mine working plus $4.5 million on social projects in the region. Finally, Moroccan efforts to resolve the dispute have been appreciated around the world. The Security Council has in several resolutions, 1754, 1783 and 1813, welcomed the "serious and credible Moroccan efforts to move the process forward towards resolution." These statements came after Morocco presented an autonomy plan for the Sahara within Moroccan sovereignty as a political solution to the conflict, to be adopted by a referendum. This reflects the strategic vision to maintain stability in the Grand Sahara and in the Sahel region and to enhance Maghreb integration. The opinions expressed in this commentary are solely those of Javier Bardem and Khalfi Mustapha.